We wanted to get around and see all that Phuket had to offer. We were on a mission to find the best beach on the south-western part of the island as well as hit some historical sights. Taxis and Tuk-tuks are expensive in Phuket, especially around Patong, so they were not going to be an option for us. Other options for this kind of exploration would be with a private driver for the day or renting a motorbike. Not being confident enough in our motorbiking skills (and reading about too many crash victims) we opted for the driver. We found our driver on TripAdvisor and we used him several times while in town. We felt like we got good value on our day trip, we saw many highlights all in one day. Our guide spoke good English, and his vehicle was nice (contacts at bottom of post). If you have a longer time in Phuket motorbike rentals by the week or month are very affordable. With the exception of a few busy stretches of road, navigating a motorbike looked much easier here than in Bangkok. We made a short stop to tour the lighthouse and its grounds. The views from here were great, with nice views of colorful bays and in the distance, you can see the western beaches. At top one of the higher hills, near the center of the island, sits the Big Buddha. The statue alone is worth the visit at 45m tall made of all white marble. There is also a small museum and gift shop located in the base. From the site, you get nice views of the entire island. Don’t miss your chance to get a coconut Ice Cream served in a hot-dog bun, yum. The temple serves as one of the main places of worship on the island. A mix of locals and tourist were about when we visited. If you hear any loud firecrackers going off, don’t be alarmed. Apparently one of the temple’s revered monks loved firecrackers. So in order to honor him people will light them off in a designated area on the grounds. Next time you are eating a handle full of cashews, take a second a think of the ladies hard at work to make it possible. Shelling the nuts is done by hand at the Sri Bhurapha factory. These ladies work hard for their wage, they are paid by the Kg and it’s not much. Most of the workers are paid less per day than the cost of one bag in the gift shop $8usd. In the gift shop, they sell a wide array of flavored nuts, some of the more notable ones are Tom Yum soup flavored, honey-sesame, garlic, chocolate covered, and many more. Our visit was in dry season so the water falls were not as grand as they are at other times, but it was still good to hike for a little bit. This would be a nice place to have lunch, with a few tables along the path. You could pack your own lunch or there is a small store at the start of the short hike. Our driver: Panya – http://www.facebook.com/panya.kamman – Email: [email protected] he was amazing and would hire him again in a heartbeat. Phuket was not our favorite beach in Thailand at all. 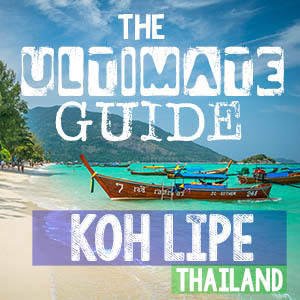 The best beaches in Thailand can be found on the island of Koh Lipe. Koh Lipe is called “The Maldives of Thailand” and we’ve spent 5 weeks island hopping in the Maldives so we know what the Maldives looks like. Yeah ice cream in a hot dog bun is not that great…and I am an ice cream lover! I ate the ice cream first, then the bun…not wasting here!